Milestones magazine by the Institute of Advanced Motorists. Homepage. This page: Fronted by a photograph of a Vauxhall VX 4/90, a copy of Milestones magazine from 1963. Milestones - Institute of Advanced Motorists. 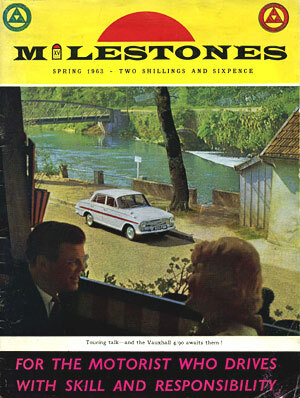 Milestones was a quarterly magazine produced by the Institute of Advanced Motorists (IAM) for its members, the issue here dating to Spring 1963. On the cover is a Vauxhall VX 4/90, and a slogan "For the Motorist who drives with skill and responsibility" - whether this relates to Luton's finest, or the IAM, isn't clear. The rear cover advertises Lucas batteries - "Britain's Best Battery" we're told. The IAM survives to this day and by all accounts is going from strength to strength - in 1963 the reader is advised that some 37,000 copies of this issue would be sold (ie distributed to members), and today their website confirms that current membership levels are 100,000+. Today, as in 1963, the IAM's aim is to encourage motorists (two- and four-wheeled) to take a greater interest in the standard of their driving, aided by instruction courtesy of IAM instructors, and hopefully a successful navigation of the Advanced Driving (or Riding) Test. Members still receive a magazine, although one called "Advanced Driving", rather than Milestones. The magazine runs to 54 pages in all, and is black and white throughout its pages. A look inside the Milestones magazine. Now for a brief look at this title's contents. The magazine starts off with four pages of members' letters, discussing all manner of motoring topics. Mr Egan, for instance, writes to the editor and is full of praise for the skidpan training he recently received at the Bovingdon skidpan, the new-found experience that he'd gained saving him from "ignominious embarrassment" while negotiating the wintry roads of 1962/1963. On page 7 there is an interesting snippet about a chap with his vintage motor-car, and the IAM test. "Is this the oldest car to have entered for the test - both car and driver passing?" we're asked. The question refers to a Mr James, of the Vintage School of Motoring in Bromley, Kent. He took the test in his 1926 1.5 litre AC Royal tourer. What was the Vintage School of Motoring? Was it simply the name of a driving school that could trace its roots back to the earliest days of motoring, or did it use older vehicles for giving instruction to aspiring car drivers in the early sixties?? Facing the correspondence pages are several interesting old advertisements. The first, for Car Mart Ltd, advertises the various Austins that were on offer in 1963. Anyone needing a small and nimble runabout may have opted for an Austin Mini for instance, priced at £447.12.11 (inc Purchase Tax), although if they needed a little more space they'd have had to shell out £556.7.11 for the recently-updated A40 Farina, by now in Mk2 guise. Buyers looking for a four-door saloon could opt for the Austin A60 at £720.14.7, while those with deeper pockets could choose to waft around in BMC's A110 Westminster, on sale for £1,051.16.3 all in. 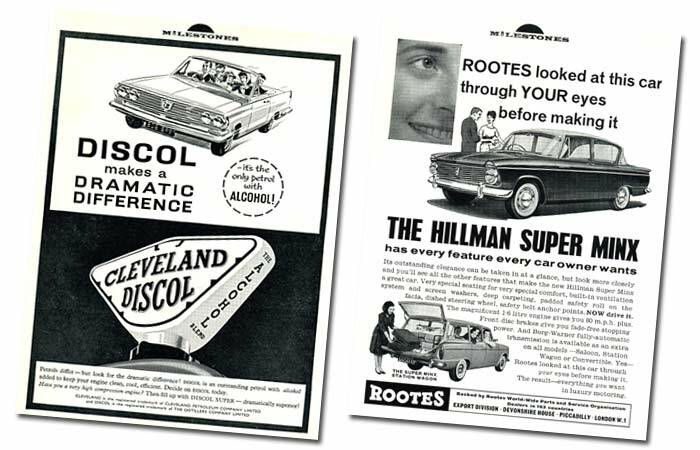 Once you had procured the vehicle of your choice, you'd then need to put something in its tank, and a full-page advertisement for Cleveland Discol petrol tried hard to catch the motorist's attention. A cheerful family, seen speeding along in a convertible car of American descent, are enjoying the "dramatic difference" that running on Discol would give them - ".. the only petrol with ALCOHOL!". Benefits of using this fuel included the engine running both cool and clean, and those who ran a car with a high compression engine, were recommended to look out for Discol Super - a "dramatically superior" blend. Despite being third overall in the 1963 Monte Carlo rally, the Morris Mini-Cooper of Altonen and Ambrose was the first British car home, something that Castrol, as supplier of the car's lubricants, was keen to be a part of. 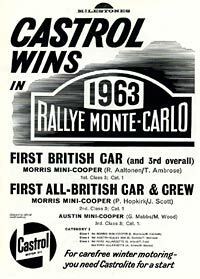 The first all-British crew to complete the event was the Mini Cooper of Hopkirk and Scott, again using Castrol oils. Many other advertisements are to be found sprinkled amongst the IAM articles. Who remembers choosing Dunlop's new C41 Gold Seal tyres for instance, or buying a Unicrest GB plate to go on the back of their car prior to a Continental road trip? Perhaps you'd do the trip in a Hillman Super Minx, a full page ad for which appears on page 17. Both four-door saloon and the handy estate, with its split horizontal tailgate, are illustrated, the former having a curved rear screen that would disappear on later Super Minxes. Top speeds in excess of 80 mph were promised from its willing 1.6 litre engine, easily controlled by front disc brakes, fitted as standard to this model. Safety considerations were not seen as a high priority in the early 60s, yet mention is given of the Super Minx's padded dashboard top, seatbelt anchor points and dished steering wheel in this particular advertisement. All models (including the rakish convertible version) could also be purchased with Borg Warner automatic transmission, if the thought of selecting your own ratios was a little too much. A couple of pages further on and we're reminded of Jaguar's "Grace ... Space .. Pace" for which the marque was, and is, so well known. In the 1960s it was still a British firm, selling such beauties as the Mk2, the E-Type and the luxurious Mk10. These were indeed halcyon days for the Browns Lane firm. Although these fine machines were keenly priced, they were still the preserve of the moderately-well heeled members of society. Although nice to read about, I suspect most readers of Milestones magazine related better to products advertised elsewhere in Spring's issue - the New Cortina Super (in Mk1 form) on page 24, with its "Extra Power! Extra Luxury!" would be a best-seller for the Dagenham bean counters, thanks to its 5-bearing 1500cc engine and modern design. Sixty miles an hour, if conditions permitted, could be reached in a crossply-shredding 19.5 seconds, with a top speed somewhere in the 80s available to the real press-on type. The price? starting at £669.19.7 all in, usefully cheaper than many other four-door saloons of the time, such as the aforementioned BMC Austin A60 (at £720 plus), a design that by 1963 was already starting to look a little dated (having first appeared as the A55 Mk2 Cambridge in 1959). The Austin was entering middle-age, whereas the Cortina was bang up-to-date and looked really rather rakish. Practical types prefer estates over saloons, and Vauxhall was intent on promoting the new Estate Car De Luxe version of the Victor in this Spring '63 issue ... "Practical chap? Must have estate car? Fair enough. Human? Luxury loving? Sybarite! Go on, admit it. And why shouldn't you be - at least where cars are concerned?". The lure of deep-pile carpeting, a heater, leather upholstery and 46.5 cubic ft of loadspace would no doubt have been a tempting proposal, as would the benefit of "30,000 miles between lubrications" - really?? Tips on travel both in the UK and overseas feature regularly, as do advertisements promoting sea, road and air travel. Several "Autovacations", driving holidays abroad organised by the Managing Director of the Continental Touring Club Ltd, are also described, all designed to encourage safe, well-organised, sorties across the Channel. For those who fancied a road trip along American freeways, a proposed trip to the USA might be of interest. Seats on board a BOAC Bristol Britannia flying to New York would cost £63 2s per member, but only if 109 people confirmed a booking. A full itinary of coach trips and visits were planned after the arrival on August 26th, with the route taking IAM members, via many famous attractions, to Toronto (Canada) by September 5th. The return flight to London, again from New York, was planned for Monday, September 9th. Did this trip go ahead? If you enjoyed air travel, but still wanted to take your own car for a spin along the French Autoroutes for instance, then salvation was at hand thanks to British United Air Ferries (BUAF), a merging of the services previously offered by Silver City and Channel Air Bridge. Flights were available from aerodromes at Hurn, Southend and Lydd, with a number of destinations on offer. The ad shows a Mk2 Ford being loaded through the front loading door of a British United Carvair aircraft.